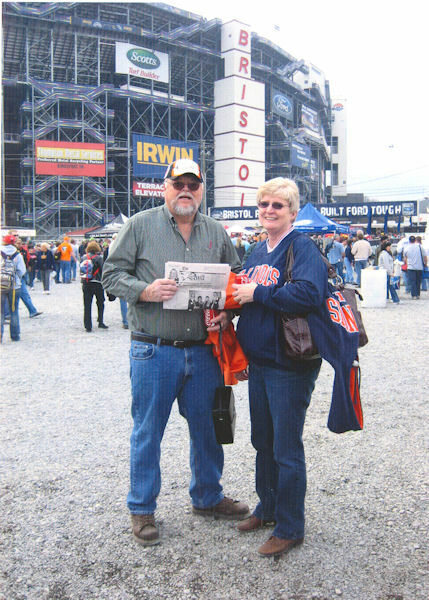 Sunday, March 21, 2010, Hugh and Sheila Forbes of Media and Bob and Barb Bailey of Gladstone took "The Quill" along as they attended the Food City 500 NASCAR race in Thunder Valley near Bristol, TN. Hugh and Sheila are standing in front of Bristol Motor Speedway with their Quill. Rain was a threat all day but they were able to complete the whole race. It was an enjoyable event, even though the wrong driver, Jimmy Johnson, #48 won. When you go on a trip, take "The Quill" along and have your picture taken with it, then send it to us. Let's see where all "The Quill" can travel.